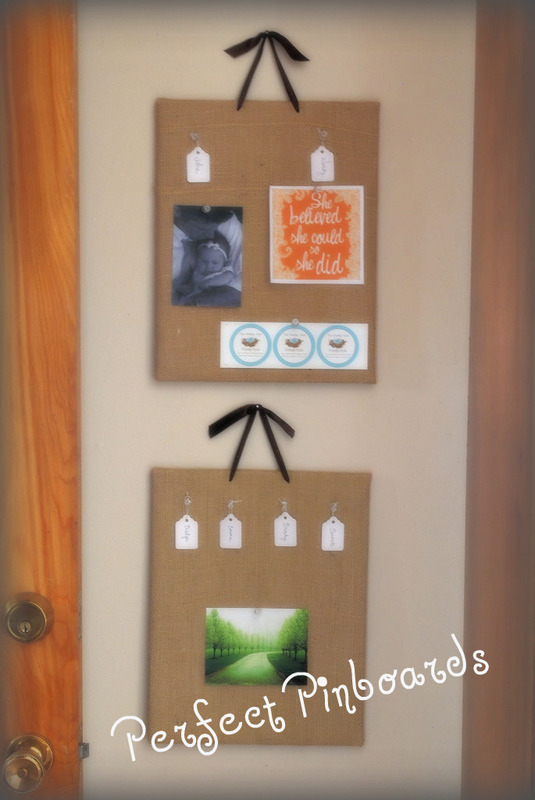 Today I wanted to share with you some pinboards that were inspired by magnet boards I saw in the Ballard Designs catalog. Here is my version. (never mind the wrinkled burlap...it has since smoothed itself out.) Look's pretty good, if I do say so myself. Because I like to do things on the cheap (this IS Frugal Friday after all) I went and bought me a 3-pack of cheap-o 11x14 canvases from Wally-world. Then to make the holes for the ribbon, I used a skinny phillips head screwdriver (I couldn't find our awl) and banged the holes into the board with a hammer. It worked like a charm. Then I cut some burlap I already had on hand to about 1" larger (all the way around) than the canvases and hot glued the edges to the back...making nice hospital corners. I spared you all a picture of this step, because I know you have good imaginations. 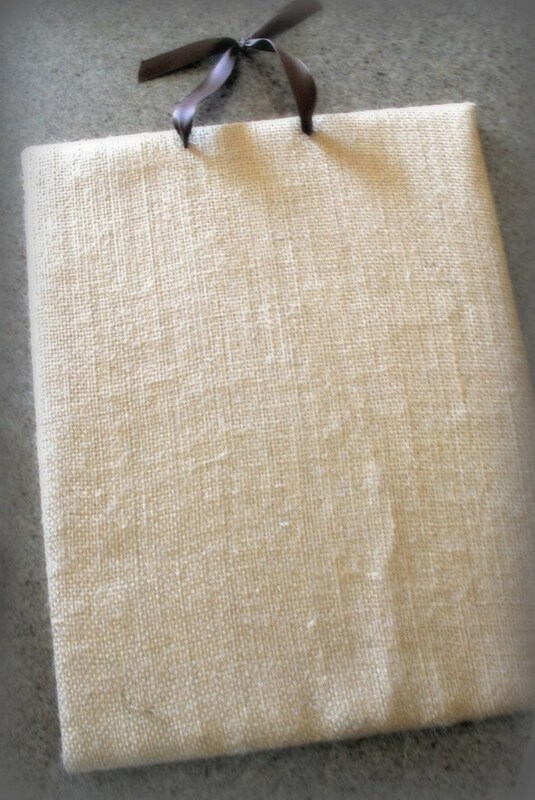 Because burlap has a loose weave, it was simple to poke holes in the burlap where my existing holes were in the canvas. After that, I strung the satin ribbon through and tied it in a knot. Easy peasy. I originally intended to make 3 boards, but the funny little space in my kitchen was really only big enough for 2. I love how they look!! And the cost? $6 for the canvas. Everything else I already had on hand. Oh yeah. Now, my dear readers, let's see what you all have up your sleeves this week!! 1. Please link directly to your post not just to your blog. 2. Please link back to The Shabby Nest so others can enjoy the Frugal goodness. ok, I love the burlap board, I actually have one. I got it as a giveaway from Beneath My Heart. Love it! I think they look like pin boards too. Great idea! I need to make something for over my sewing machine to collect ideas on. Thanks for hosting Wendy, I've linked up my picnic basket on the porch. Love how your noticeboards turned out, have to try that, I love burlap!! Cute pin boards. Great Idea! I love how the boards turned out and they look great on the wall together. I bought those boards just yesterday, but I have another idea for them. Hopefully I'll be able to work on them this week. I seriously am the queen of looking at a picture and thinking "I can make that" and never reading the instructions! Sounds like you have the same Adhd crafting problem! The boards look great! I would have thought they were pinboards as well. Burlap and brown ribbon make such a beautiful combination. These are so cute! My daughter has been wanting some PB pin boards for her room...I think I like yours better....and the price too! Thanks for showing me how to make one! Those pin boards look awesome. What a great knockoff to Ballard's very expensive items. totally clever! on my to-do list NOW! Thanks for hosting once again! :) Can't wait to look at all the great ideas! This project has been in my 'to-do" pile for a long time-i love seeing what you've done with them! Great job! Ooooh ~ I love this project and I think I could actually do this one. So cute! I have this project in my idea folder, making a magnet board out of an old baking sheet. Now I'm totally inspired to actually do it - I'm sure it'll be a quick project! Love the boards, I saw them in the BD catalog and thought the same thing "I can make those!". I wasn't sure what materials to use so thanks for the tutorial.